This past 24 hours without easy access to the internet has given me time to ponder the modern technological miracle that is the World Wide Web. 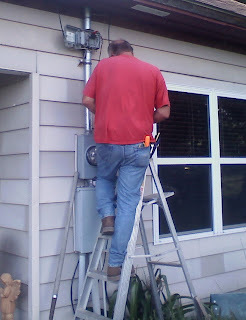 (Joe, the Verizon Guy was up on a ladder outside my house this morning repairing my connection.) I'm not a tech guru, so my understanding of the internet is strictly practical and utilitarian. I was kidding a lot yesterday about how I was getting the shakes without being able to check e-mail and all the social networking sites where I spend a good deal of my day. But I really started thinking about the place I've given to my computer in my daily life. I even happened upon an article called "Moms and Internet Addiction" that had me a little nervous for a minute. Even before I started an on-line mail order business, I learned about the convenience and immediacy of e-mail. How wonderful to communicate, even in one direction, with people who didn't share my night owl bio-rhythm, or were in different time zones across the country! Instead of calling at inconvenient times, or launching a deep conversation when I only needed to convey quick, non-essential information, it was a wonderful option to fire up a quick e-mail and be done with it. The folks on the other end could pick up the message at their convenience and respond, also at their convenience. Then, people started discovering the dangers of e-mail: sending a note accidentally to the wrong recipient (ouch), forgetting to include the critical attachments (dang), and most troublesome, innocently offending the recipient because of the difficulty in communicating nuance of intention through the written word (ruh-roh). Because of these challenges, many people avoided e-mail altogether. Which was kind of overreacting, in my opinion. E-mail, and the mind bogglingly vast internet, are just tools. Tools can be used for good or ill - a hammer can build a house or break a window. Tools are good or bad depending on the intentions of the wielder. Along comes my first social network experience, Ravelry. If you're a knitter, you probably know about Ravelry--a place for knitters to connect, organize their stuff, and find ANYTHING related to knitting or crochet. It's a beautiful site, and very addicting. When I started marketing my farm more aggressively, I could see how all these sites could get the word out about my CSA and products in a very economical and professional way. I "met" lots of kindred spirits. I finally gave in and got a Facebook account, and I put up a profile at LocalHarvest.org, and CattleGrowers, Farmers for the Future, and Alpaca Social. Not to mention Twitter. Good tweeting takes some practice, and a lot of effort. Again, some people abuse the tool, but in deft hands, it's a wonderful marketing and networking venue. All this takes time. But building a good business reputation has always taken time. I want so badly to let people know that the farm is here and has so much to offer. I'm not going to sit on the sidelines and hope people drive onto the property and ask me how they can get involved. I think with all these tools, getting the word out takes less time than it used to. An on-line presence is critical, but it has to be backed up with a real person with real integrity. And all the well-placed ads in the world don't replace actual relationships with clients and customers. So, I'm happy to say that even as I work on getting the word out on the internet about Jacob's Reward Farm, I have my flesh and blood family and friends to remind me that it's face to face where the real magic happens. And my daily chores and labor remind me that the farm is a wonderful physical place that needs care and maintenance and nurturing. In the end, it's balance I'm working for... balancing time in the real world with my family and animals and garden, with time on the 'net singing the praises of the life we have together here at the farm. I Love it! Hope to see y'all Saturday, and get face to face with the new boys! Ah, Ms. Louet, Have We Met?